Eastern hellbenders have become a bit less elusive in north Georgia. DNA analysis of water samples from 98 sites across the top of the state have provided Department of Natural Resources wildlife biologist Thomas Floyd a clearer picture of where the massive salamanders are still found in Georgia. That’s good for hellbenders and the scientists who study them (video). Historically found from New York to northeastern Mississippi, eastern hellbenders are in decline and considered a candidate for federal listing because many of the clear, cold streams they need have been degraded by runoff, silt and impoundments. Although hellbenders can grow to more than 2 feet long, their camo coloration and preference for hiding under large rocks make finding them a challenge. Through a process called environmental DNA or eDNA, samples analyzed by Steve Spear of Orianne Society documented the salamanders from skin cells carried in the current. 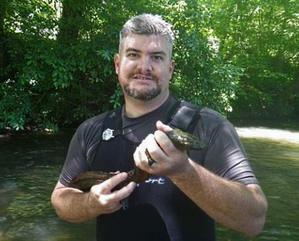 Sample locations were picked to determine whether hellbenders were present at a number of historical sites, plus several streams that had not been sampled using traditional techniques – flipping rocks and snorkeling (video) – and others outside the species’ known range in Georgia, the Tennessee River drainage. The eDNA analysis confirmed the presence of hellbenders at six of 10 historical sites where they had not been seen in at least five years, 13 of 25 streams that had not been physically surveyed before and one site where hellbenders had been reported but researchers had been unable to find them in recent surveys. Also, although what looks like suitable habitat is found in streams that drain into the Chattahoochee, Conasauga, Etowah, Oostanaula and Savannah rivers, samples confirmed the presence of hellbenders only in the Tennessee drainage. Floyd, who works for DNR's Nongame Conservation Section, said lab analysis showed that DNA amounts at historical sites that tested positive were minimal compared to levels found in streams with healthy populations. Also, eDNA tests did not detect hellbenders in any northwest Georgia stream, including those in the Tennessee basin where the species had been seen before. “Hellbenders weren’t even detected from a stream stretch where a specimen was found in 2011, which indicates that – like several of the historical sites – the populations there are likely really small and it is uncertain as to whether they can persist into the future,” Floyd said. Floyd is awaiting results from further lab work by The Orianne Society -- analysis referred to as quantitative polymerase chain reaction, or qPCR. This process not only tests for the presence of a species’ DNA, it determines the quantity of DNA in a sample. The measure will be compared to hellbender abundance determined by traditional surveys, hopefully shedding light on how abundant the creatures are at sample sites. Floyd is also intrigued by positive readings – and a recent hellbender discovered by DNR’s Stream Survey Team – in a stream near Blairsville that has few large rocks for “mud dogs” to hide under. “My suspicion is they’re hanging out in the banks,” Floyd said, noting that behavior has been documented in Japanese giant salamanders, which are similar to hellbenders but even bigger (video). Although hellbenders are completely aquatic, they have lungs and lack gills. How do they breathe? Through capillaries in their skin, a structure that underscores their reliance on clean water. The species’ genus name, Cryptobranchus, is derived from two Greek words that translate as “hidden” and “gill,” alluding to the fact that adults lose the external gills found in larval hellbenders. A rash of dolphin strandings on Georgia beaches likely marks the arrival of morbillivirus, the disease blamed in the deaths of more than 800 bottlenose dolphins since July 1 along the mid-Atlantic and southeastern U.S. coast. From Nov. 15-26, DNR documented 12 dead dolphins in Georgia. Wildlife biologist Clay George of the Nongame Conservation Section said the state usually has about 22 dolphin strandings in a year. Morbillivirus, a measles-like virus that affects the lungs, brain and immune system of marine mammals, has not been confirmed here yet. Test results from the first of the stranded dolphins are expected early next month. 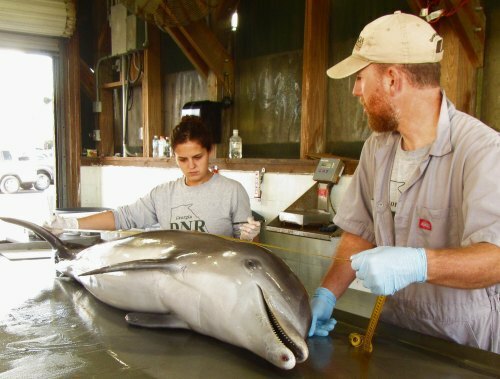 But bottlenose dolphins in South Carolina and Florida have tested positive as the disease shadows the seasonal migration of coastal dolphins from the upper mid-Atlantic, where a spike in strandings led NOAA Fisheries to declare an Unusual Mortality Event this summer. Nongame Conservation Section staff are taking samples and conducting necropsies on select dolphins. Many of the stranded dolphins had respiratory lesions, which is consistent with morbillivirus infection. Georgia Marine Mammal Stranding Network partners have helped with strandings and monitoring on barrier islands. Carcasses also are being checked against photo databases of resident dolphins kept by Savannah State University and the Georgia Dolphin Ecology Program. The goal is to gauge the virus’ impact on resident dolphins, which spend their lives in Georgia waters, unlike coastal dolphins that migrate along the Atlantic coast. While morbillivirus does not affect humans, the public is urged not to handle stranded dolphins, but to report them to the Marine Mammal Stranding Network at 1-800-2-SAVE-ME (1-800-272-8363). George hopes the wave of strandings passes quickly and totals level off – something that may already be happening in mid-Atlantic states. But it’s a wait-and-see situation. During the previous morbillivirus in 1987-1988, the deadly surge lasted into spring. NOAA Fisheries has two new smartphone apps to help people report sick, injured or dead marine mammals and identify and watch marine mammals responsibly in the wild. With Dolphin & Whale 911, users can report stranded dolphins, whales and seals in the southeastern U.S. – reports that are sent immediately to responders and can include GPS-stamped photos of the animal. Both apps are available free on iTunes and in Google Play. Steven King’s “Living Habitats of Georgia” project caught the eye, and admiration, of reviewers for TERN’s $1,000 grant for top science educators. King, science teacher at Whit Davis Elementary School in Athens, was recently awarded the grant given annually to a third- through fifth-grade public or private school teacher in Georgia who demonstrates exceptional energy and innovation in teaching life sciences. He’ll use the money from The Environmental Resources Network, or TERN, to help students create and maintain Georgia-specific habitats with representative animals and plants in aquariums. According to King’s proposal, students will share their observations of the animals in photo journals made available in the media center and through videos broadcast on the school’s cable TV channel. Scientists and students from UGA’s Warnell School of Forestry and Natural Resources also will be called on to help with projects. Through King’s project, some 600 students in K-5th grade will be able to investigate nongame wildlife and their habitats, according to Linda May, Nongame Conservation Section environmental outreach coordinator. May, who reviewed proposals along with Nongame Environmental Review Coordinator Anna Yellin, wrote that by teaching about Georgia habitats and the native plants and wildlife associated with each ecoregion, “Mr. King is helping his students to appreciate our state’s rich biodiversity and encouraging the wise use of our natural resources." King is also drawing the media’s eye. The Athens Banner-Herald covered the grant announcement, which included a live animal presentation by Charlie Elliott Wildlife Center’s Pete Griffin. North Whitfield Middle School students recently helped Fisheries Management staff with the DNR Wildlife Resources Division release lake sturgeon into the Coosawattee River in Gordon County. Lake sturgeon fingerlings are raised at the Go Fish Education Center and Summerville Hatchery, and released each fall as part of an ongoing restoration effort. See photos. 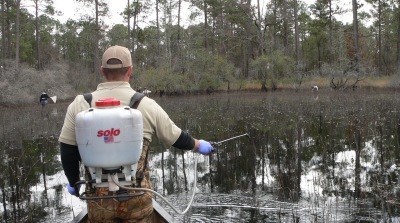 The gopher frog pond at Williams Bluffs Preserve in southwest Georgia was treated this week to kill predatory fish washed into the normally fish-free wetland by heavy rains last spring. The work (left) done by staff of the Nongame Conservation and Fisheries Management sections, The Nature Conservancy, and UGA will make the pond suitable again this winter and spring for the rare frogs to breed and their young to develop, hopefully continuing a successful effort to establish the species at The Nature Conservancy preserve (“Eggs mark leap forward,” Feb. 28). Georgia’s new bobwhite recovery plan has wide support – the state Bobwhite Technical Team represents 15 organizations – and tall goals: Successful implementation within priority landscapes will restore some 24,000 wild quail coveys. The Bobwhite Quail Initiative 2013-2023 is focused on restoring northern bobwhites and other wildlife that depend on early successional habitat. A sixth red wolf has been found dead in North Carolina, and the U.S. Fish and Wildlife Service is requesting help with an investigation into the suspected illegal take of the endangered wolves, all killed within the last four weeks. The reward for information leading to an arrest and conviction has grown to $26,000. The latest Right Whale News covers topics including estimates of the North Atlantic right whale population, updates on the proposal to continue speed limits for large vessels and changes in the way right whales use the Bay of Fundy. Subscribe to the free newsletter via the North Atlantic Right Whale Consortium. A recent field day at Forest Lodge Farms in Camilla treated some 45 landowners to forestry-related presentations including about gopher tortoise habitat and related Natural Resources Conservation Service programs. 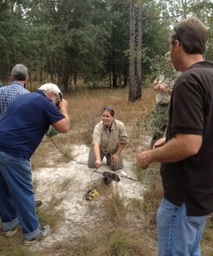 Participants peered into a tortoise burrow with a burrow camera (left), and even had an impromptu lesson on conserving longleaf pine ecosystem species after finding a southern hognose snake. Yadkin River goldenrod, found only along Falls Reservoir in North Carolina, is no longer a candidate for listing under the Endangered Species Act thanks to a Candidate Conservation Agreement with Alcoa Power Generating. Alcoa owns the land and agreed to help make sure Yadkin River goldenrod doesn’t go extinct, triggering a U.S. Fish and Wildlife Service decision to remove the species from candidate status. 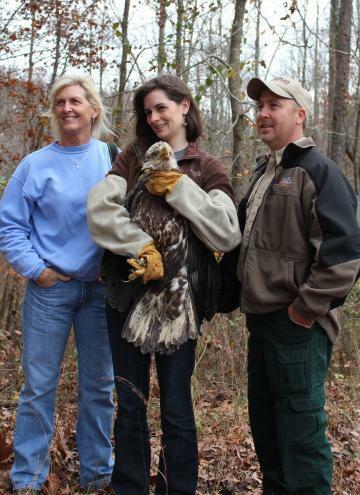 carried it to the Southeastern Raptor Rehabilitation Center at Auburn University. Rehabilitation Center made arrangements to return it to the wild as soon as possible. also took part. Bald eagle profile. The Nongame Conservation Section of Georgia DNR receives no state funds toconserve nongame wildlife, native plants and natural habitats. Instead, we depend on contributions, grants and fundraisers, including the eagle and hummingbird license plates. nongame wildlife.Nongame includes wildlife not legally fished for or hunted, plus native plants and natural habitats.